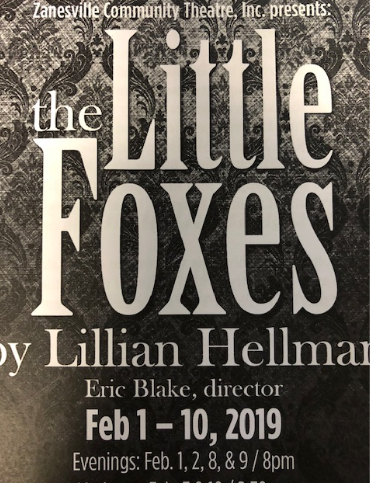 ZANESVILLE, Ohio – Today, was the final show day for Zanesville Community Theatre’s play, The Little Foxes. The Little Foxes is a play about corrosion of the soul and corruption of the heart that is one of the effects of capitalism. Many consider the story to be a classic of 20th Century American drama. “It’s not a musical, but it’s a dark drama that really makes people think. When they leave, they leave thinking. And just the quality of the performance, the quality of the actors in this show is amazing. And the set and the quality of the actors itself should bring people in,” said Director of The Little Foxes, Eric Blake. Blake said the Theatre has been working on this play for twelve weeks. He explained the different factors that went into putting this show together. “Well pretty much we start with the director’s vision. And then we have auditions, and we cast the show, then we just start working with character development. And then we work right into once the set is built, we work right into performing on stage with the set, with all the props and everything else that goes into everything that you’ll see on stage,” he said. Zanesville Community Theatre’s 56th season continues with O’Donnell’s Pub, show dates take place in April.